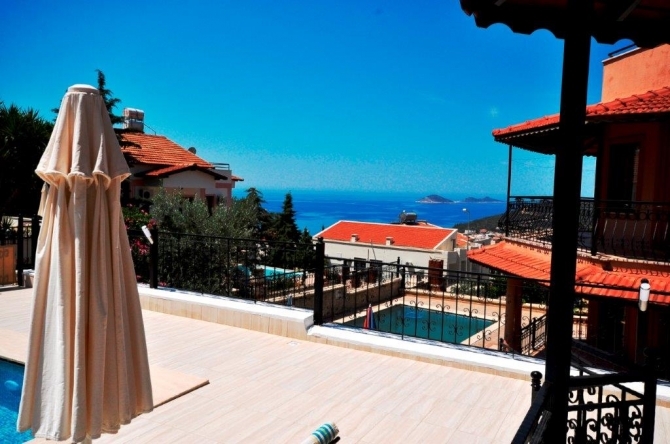 Three bedroomed, detached, fully air conditioned luxury villa overlooking the bay and harbour of Kalkan and located within easy reach of a shop, local market and the bus station. The villa is constructed over 3 floors. On the ground floor it comprises of a lounge, overlooking the pool and terrace. A modern kitchen and elegant dining area which seats 6, includes Oven, Hob, Fridge Freezer, and Microwave. Outside, is a private pool surrounded by sub tropical landscaped gardens and a raised covered patio area with table and chairs. A barbecue is also provided for Al Fresco dining. On the first floor are 2 double bedrooms both with en-suite bathrooms and balconies. 1 twin bedroom and a separate shower room are located on the second floor. Leading from the second floor landing is a large private roof terrace to enjoy the fantastic surrounding views. All rooms are fully air-conditioned and have fly screens are on all windows. Besides the famous 'Kalkan Style' historic architecture, the many excellent restaurants of Kalkan contribute to the special atmosphere within Kalkan. 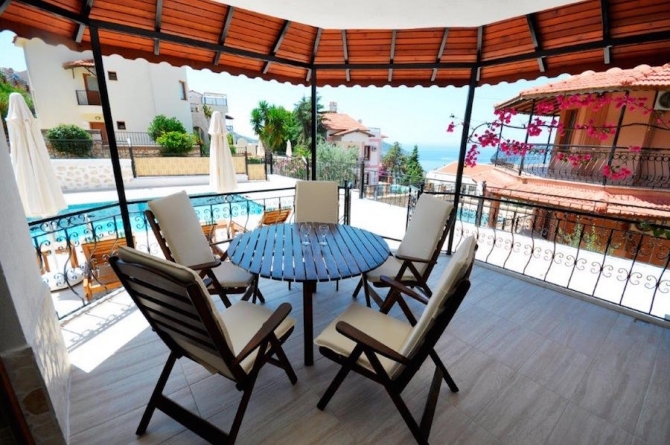 Additionally, Kalkan is especially renowned in Turkey for its numerous roof terrace restaurants and bars which offer a wonderful view of the town, sea and stars. There is lots to do during the day and nightlife is fun, but laid-back. You won't find noisy, wild nightlife here, like in some other coastal resorts.